If there was one dish I loved more than any other as a child, it would be my mother’s homemade waffles. Life was good when that enormous waffle iron was plugged in and heating up. She used a recipe for “Oh Boy!” Waffles from her stained, yellowed, old copy of her red and white checked Better Homes and Gardens Cookbook. I asked for them for my birthday and every special occasion I could find or make up. 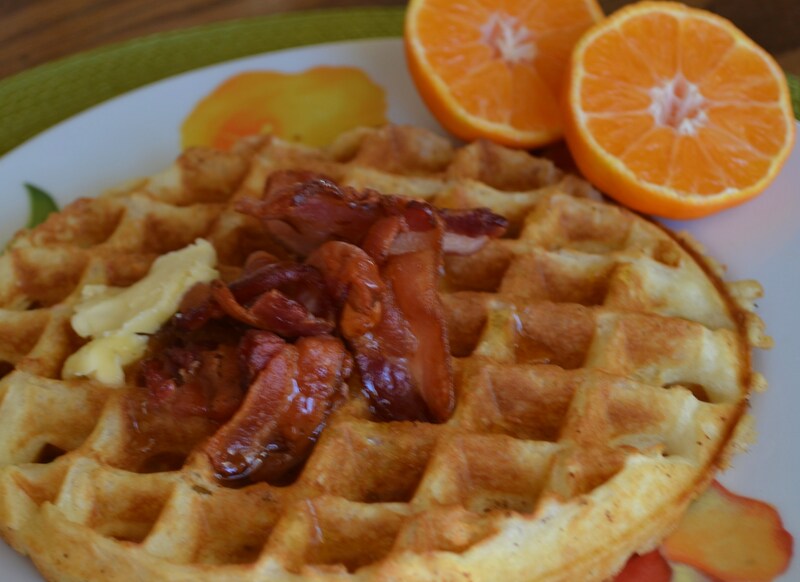 I’ve tried dozens of other waffle recipes, and none compares to this very old standard. Today I substituted almond milk for a little more than half of the diary milk and used a light olive oil in place of the vegetable oil in the original recipe. Insert me high five-ing myself right here. No kidding. The BEST WAFFLES I’VE HAD IN MY LIFE. Period. Light as air, crispy…. Simply perfect. To me there is nothing worse than a heavy waffle, the kind where, if you take one bite you feel like you already ate the whole waffle and need to go lie down. If you, like me, prefer an airy, tender waffle, brown and crisp on the outside, a waffle that leaves you perfectly, lightly satisfied instead of feeling like you swallowed a ball of dough, prepare to fall in love. 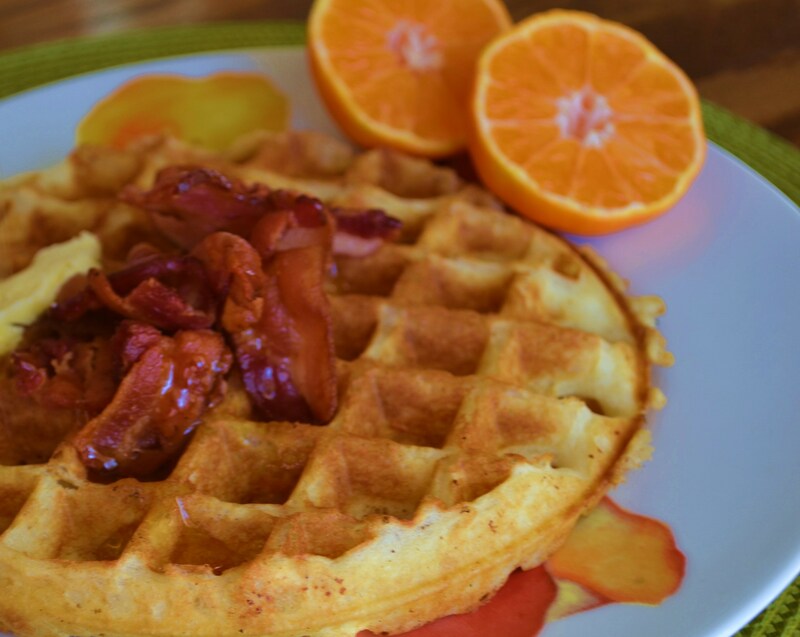 We also love bacon with waffles, and I’ve found that cutting the bacon up before browning (I use kitchen shears) and then stacking the pieces atop the waffle to serve not only looks pretty, but allows you to easily get a little bite of bacon with each bite of waffle. Plus you get a little syrup (we indulge in pure maple syrup and close our eyes at the price), on the bacon: maple and bacon together make a very happy coupling in your mouth. In a large mixing bowl, whisk the flour baking powder salt and sugar together. Make an indention in the middle of the dry ingredients and put eggs, almond and dairy milks and olive oil in the indention. Whisk the wet ingredients in the middle of the bowl and graduation pull in the dry ingredients around the sides until thoroughly whisked. Batter will be loose, and you make think it is a bit on the then side. Also as it sits it will begin to rise a bit in the bowl. Using a long-handled measuring cup, put about 3/4 cup batter into hot iron. Cook to desired crispness. 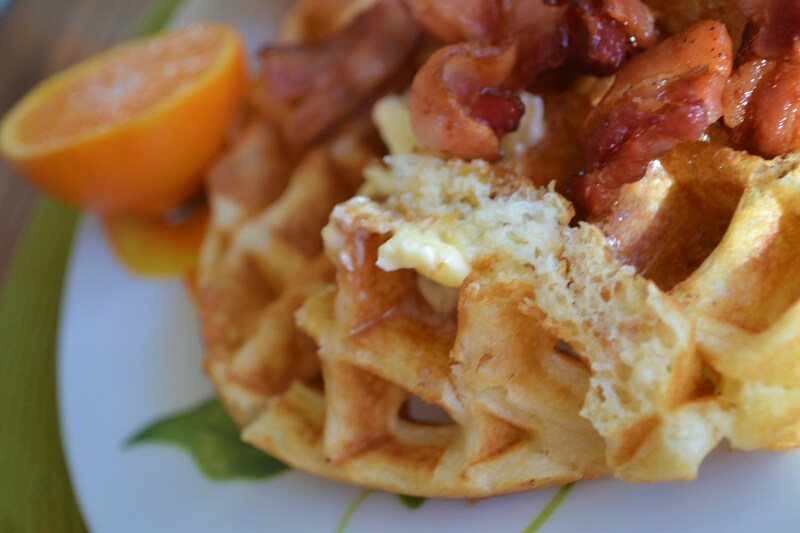 Put waffle on a plate and pile up the bacon pieces in the middle, like a little bacon haystack. Leftovers: Since this recipe makes quite a bit of batter you can use leftovers in two ways: 1) go ahead and make more waffles, on the light side, put them in ziploc bags and refridgerate or freeze. When ready to heat, put them on a cookie sheet and bake at 400 degrees until re-crisped and golden. 2) Save leftover batter in Tupperware container in fridge. Just before making waffles, add another 1/2 t. baking powder to batter to help revive the “lightness” and cook as above. This is my favorite method. Tracy, I am sure it would be awesome. But I will give the vegan version a try to make sure and let you know!